It has been awhile! I am still alive and well in Maryland, just extremely busy! I just began a huge undertaking and it is taking up all (and I mean ALL) of my free time! 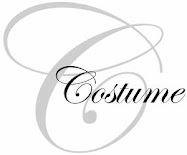 I just began a graduate certificate program for my "day" job! The certificate is in Administration & Supervision and will open some more doors for me in the future if I decide to spread my wings! 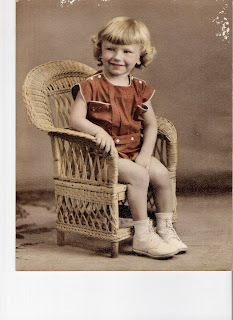 Nevertheless, a new blog post landed in my lap today when I opened up an email from my Mother. 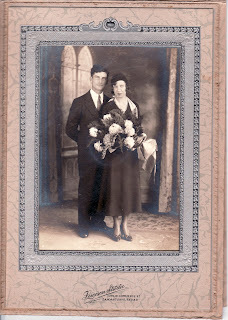 She is a wonderful writer and does a fabulous job as the family oral historian. I have both of my grandfathers on tape (gotta get them on some digital device!) and now she is working on my father. So far, I think they are in written form, but I do believe my niece made a podcast of him singing anAlsatian anthem in the Alsatian Dialect (Note to self--get ahold of that tape!). Question Prompt: Mark, what do you remember about the corn harvest when you were growing up on the Andrew Kempf farm? 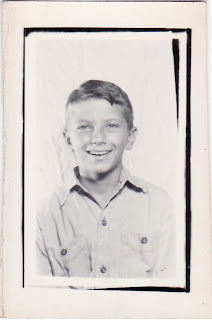 This was about in 1943 and I was not old enough to pick the corn – I was about 7 years old – and my job was to “drive” the wooden wagon, which was pulled by 2 mules. The mules were owned by my dad, Andrew. I had to hold the reins and say “giddy yap and whoa” I would tap the rear ends of the mules with the reins and say something and they would go – and they would stop when I said “whoa” – most of the time. Daddy (Andrew) picked 4 to 6 rows of corn on the side and Gerald (my older brother) picked the two rows that the wagon drove over that were on the ground – they would throw the ears of dried corn on the wagon. The wooden wagon (we still have the wagon in the barn) had a high board on one side opposite they would throw the corn so it could fall into the wagon on the low side. They went up and down the rows till the wagon was full. Then came the hard part. 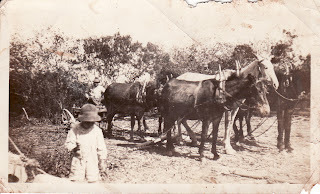 We took the wagon back to the house and we had to shovel the ears of corn into the barn, using a big corn shovel ( I still use that same shovel in the garden now). The ears were still in their shucks. of the ears would fall onto the ground when the tractor turned the corner to go to the next row. So - guess what – we had to go and pick the end of the rows of corn by hand before the corn-picker got there – so no corn would be wasted. And sometimes we just went down the rows to make sure that no corn had fallen to the ground and would be left behind. No waste. After the corn was in the barn, we had to wait for someone to bring the corn Sheller to by – there about 3 or 4 people in the county that had a corn Sheller – it was a big investment and few could afford one. They would bring the corn Sheller by and go up to the barn and a few boys and men would get inside the barn on top of the pile of corn (it was dirty and dusty in there) and shovel or push it into a trough at the barn door on the ground and it would elevate it up on the metal trough to the Sheller where it would separate the shucks and cobs from the kernels of corn – the machine would auger the kernels into a wagon – from there we would take the wagon of corn kernels to Mangold Grain Company at La Coste. 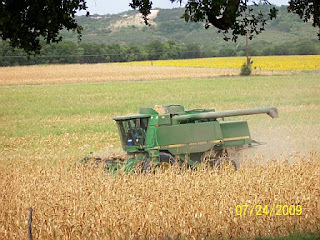 Nowadays the combine does the picking, shelling and putting into the truck in one operation and it takes maybe one full day to complete what took us a month or more, not counting the shelling. When the corn was shelled, we let the cobs lay on the ground on a pile – but the shucks were baled into big bales to feed to the cows in winter. We put a little molasses on them sometimes to make them more palatable for the cows. (What great fiber ! – r.k.) The same guys who came to shell the corn brought a baler along for the purpose of baling the shucks. I think the Zinsmeyers had a Sheller. Everybody helped everybody when there was a shelling. The farmers would follow the Sheller and go from place to place. I remember Uncle Bernard Biediger, Uncle Ulrich Kempf, Ernie Rhin, and some Echtles, all helping and going to each other’s farms. 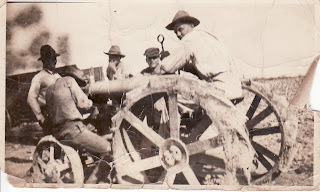 There was a crew of guys with the Sheller, but the relatives and friends also were there. We had to feed them a break in the morning – probably homemade bread and homemade butter and homemade molasses (most every year we took our sugar cane to the Echtles at LaCoste – Aunt Oliva’s family to have molasses made) Also a dinner - mostly fried chicken (we raised the chickens), homemade beans and noodles (If it was Friday it was only beans and noodles). Another break around 3 in the afternoon – more homemade bread and butter and homemade preserves like fig (we lots of fig trees) – lots of water, tea and lemonade. 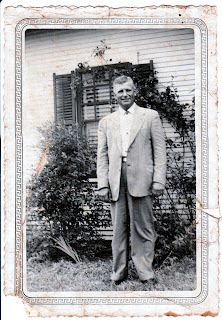 Mama (Lucille) and whoever was around – the wives of the farmers – would cook in our kitchen, which had no air conditioning. We came into the house or on the porch to eat – there were no disposable plates, so the women washed dishes and got ready for the next meal while we men went back to corn shelling. At the end of the day, there were a few cold beers – but we young kids never drank beer. 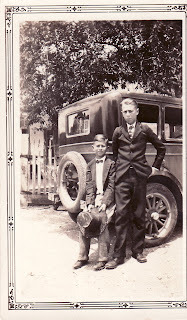 (now Sammy’s) and also went on a milk delivery truck, which went to Uvalde, delivering glass bottles of milk to stores. I had to get up a 4 in the morning to get on the truck – I did that only one summer – did not want to get up at 4 in the morning. I got about 50 cents or less an hour for that job. 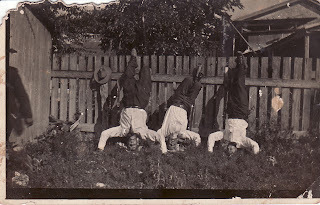 This is an early photo of Andrew Kempf, Julius Mechler & Joe Naegelin playing around! 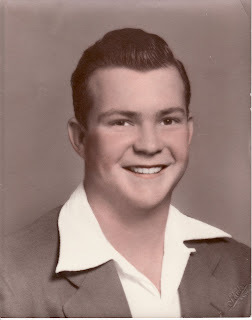 Ulrich's son, Gilbert (Gibby) Kempf--Dad's first cousin and the same age. 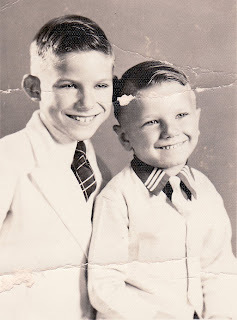 They grew up together and then Gibby's children and my brothers' and I played together. Gilbert still lives on part of the Ulrich Kempf homestead with his wife. 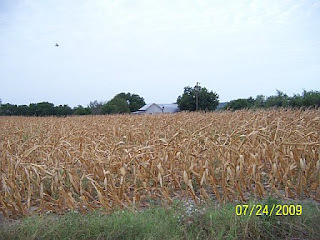 I asked Mark about his early memories of corn harvest and as we are at the computer, we can look out and see the field of now harvested corn that borders our yard - the same field Mark worked in as a young boy. The farmer who is renting the Kempf Farm land, Morris Salzman and his son, Travis, have about finished combining. They started yesterday afternoon late and came today to finish. They got into their pickup and left for lunch – no homemade beans and noodles or fresh homemade bread and butter unless they went to Sammy’s, who I think still makes homemade noodles and beans on Fridays. Their combine and tractor are air-conditioned with a closed cab so they do not have to sit in the dust and heat and they told Mark they have a GPS system so they can set the first round when they are plowing or planting and then the tractor automatically follows that pattern – they do not have to steer so can plant or plow a straight line – but still hand turn the corners at the end of the rows. I do not think the combine has the GPS only the tractor. Times have definitely improved the lot of the farmer – but he still is at the mercy of the weather – they have not figured how to order rain at the right time! The Salzman’s rent a lot of land from various people, some of which is irrigated and some of which is not – as the Kempf Farm. I am sure they will make much profit on the irrigated corn this year – because here the corn got maybe 6 inches of rain. And a lot of heat! It is 103 on the patio now – and I can see the sunflower field at Gibby’s is blooming bright yellow out the window. They planted that for Dove Hunting season. What a wonderful slice of life on the farm! I especially love the pictures! It was interesting to read the contrast to what is going on in that same field today - times sure have changed!! Thanks for sharing this. What a beautiful story of life on the farm. I, too, liked the photos and the contrast between farming now and farming then. If only we could *order* the rain ~ now that would be improvement! Thanks for the comments! Grandpa was the last generation to farm....my dad and uncle did not go into farming although the farm is leased and still being farmed. 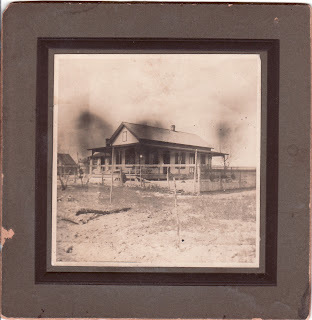 My mom and dad live on part of the original property. My mother's father was also a farmer and one of her brother's is involved in agriculture, just not as a farmer. It is a special way of life! Great post - I love farm stories. Also glad to see you posting again.